June 24th from 1:00-2:30, Emma is introducing Corde Lisse, or aerial rope, to Axis! Corde lisse (French for "smooth rope"), or aerial rope, is an aerial circus skill or act that involves acrobatics on a vertically hanging rope. In this workshop you will learn rope-specific aerial material. Get ready for beats, toe climb, and more! This is a beginner friendly class. All levels are welcome. The workshop is $35 per person. 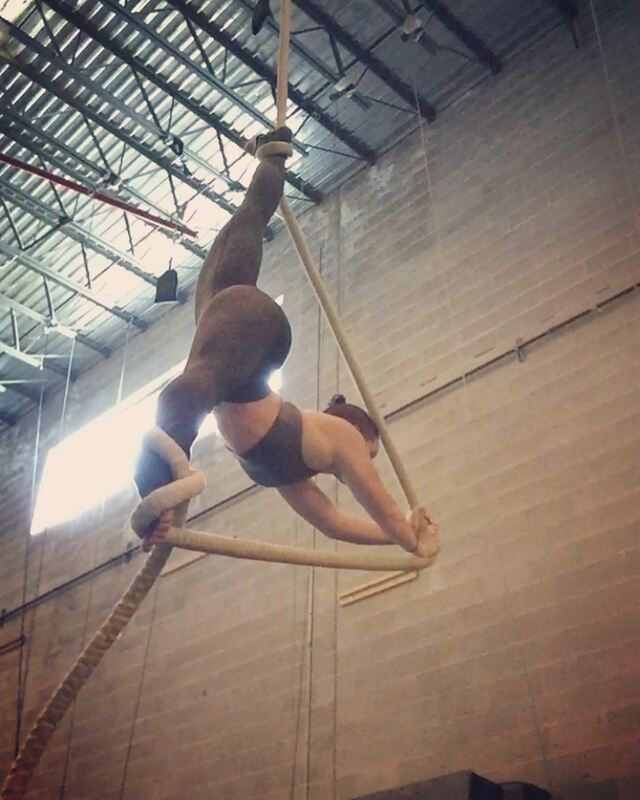 After obtaining a Bachelor of Arts in Dance at Texas Tech University, Emma Foster moved to Houston and began training in aerial arts in 2011. 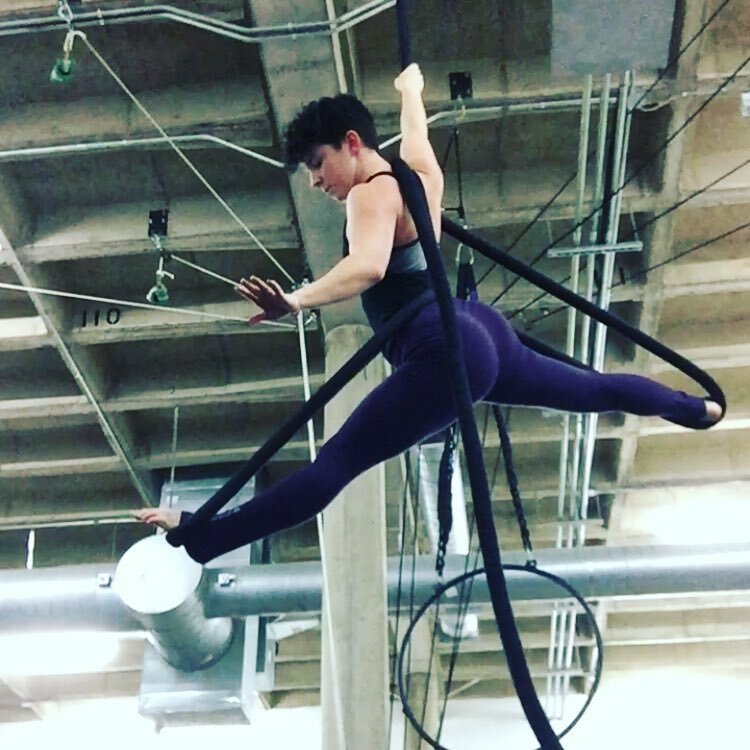 After spending some time in the field performing aerial and teaching beginner to advanced students, Emma attended Circus Warehouse's Professional Intensive Program for further study of circus arts. Emma has performed in New York City, Las Vegas, San Fransisco, Dominican Republic, and the list goes on. She is ready to teach you what she knows! Join the two hour intensive workshop in August at Axis! Join Michelle Teeters for beginner and intermediate/advanced silks workshops - just $25 per workshop! Check out what you missed from Michelle's silks workshops! Emma brings the first aerial rope workshop to Axis June 24th. Sign up for two great workshops from Michelle Teeters June 10th; watch her in action showing off what she'll be teaching. The first six people that purchase tickets to Flight Night also get to take Michelle's workshop! Rebecca Star comes to Axis May 2017 with two workshops to choose from. Join us Saturday, January 14 from 7:15pm-8:45pm for another great workshop from Brynn Route. Only 12 spots are open! Join us Monday, February 6 for two great workshops from Nadia Shariff at the Jersey Village location. Each workshop has only 12 spots open, so sign up now! Lux Alt Workshop will exceed your expectations! Axis Pole Fitness provides pole, lyra hoop, and aerial silks classes for the Cypress area (close to Hwy 290 and Hwy 6 / FM 1960). Drop by to take a class, or come by with a group of friends for a bachelorette party, birthday party, or girls night and get your dance on. Axis promotes fitness, fun, and inspiring entertainment in northwest Houston, Texas.